The one thing that I ever imagined before visiting Gulmarg was that I would get to witness lots and lots of white fluffy snow 🙂 . And so it is. My dream came true. 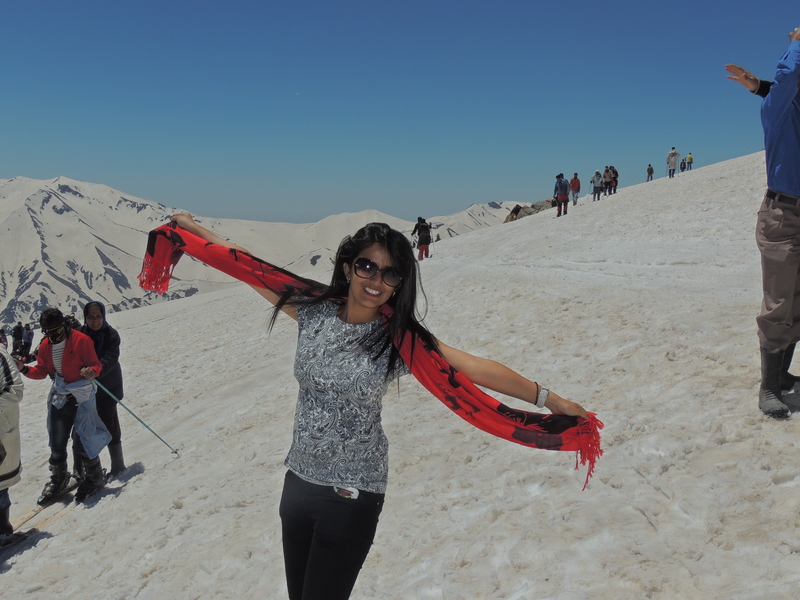 For a person belonging to the northeastern part of India, snow is something we are very much fascinated to see. 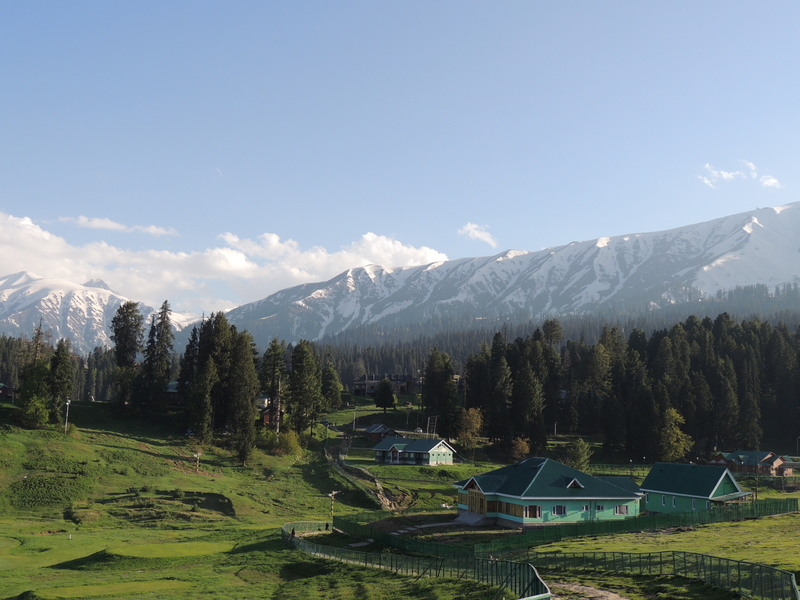 Our 3rd leg of the journey took us to Gulmarg, the beautiful hill station in the state of Jammu & Kashmir. 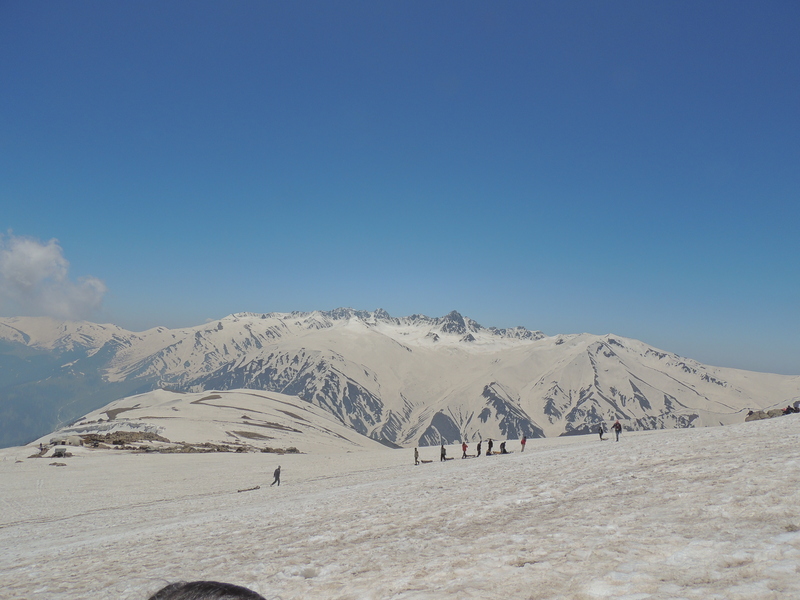 Gulmarg is mainly famous as a Skiing destination and this season starts from December to around February, details in here. At that time, not many tourists visit this place. The general tourist season starts around April and lasts till October. 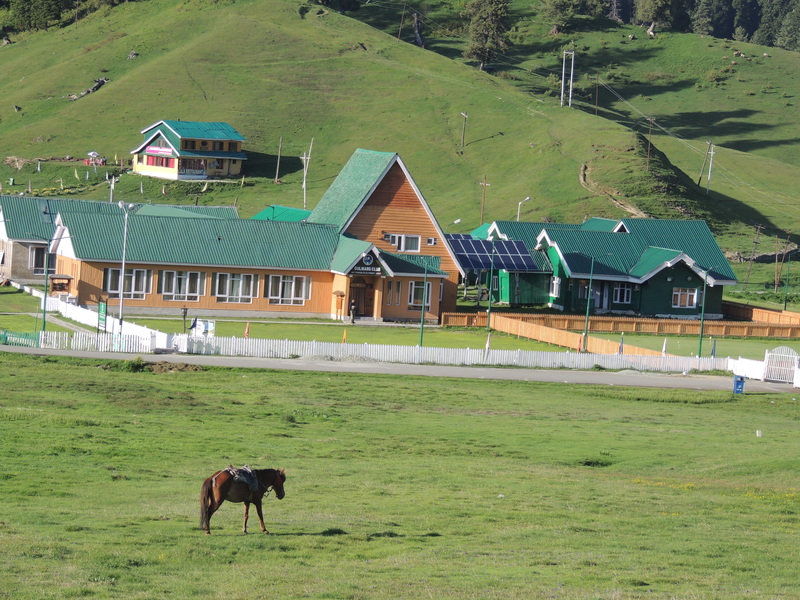 I had already covered Srinagar and Pahalgam, which are equally scenic, but the landscape of Gulmarg is very unique, as it is located at a higher altitude in the Pirpinjal range surrounded by snow-capped mountains and lush green meadows. 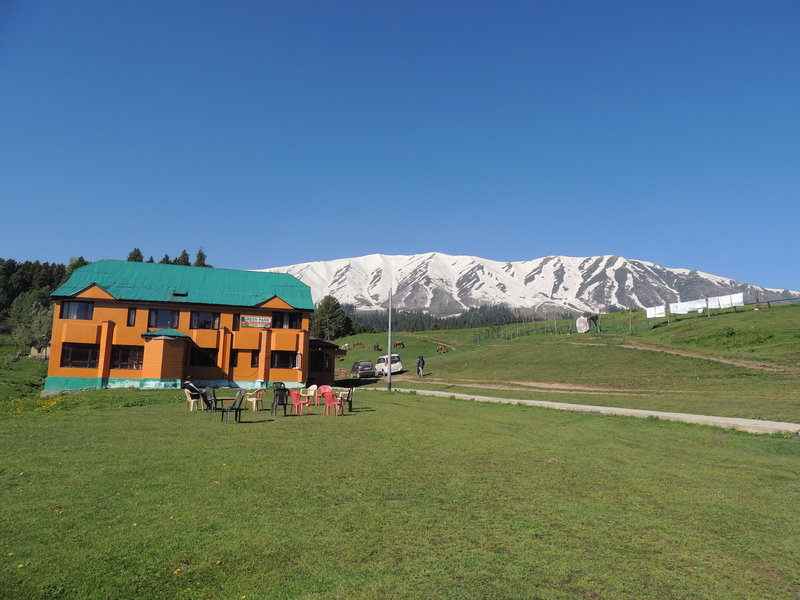 By afternoon we had reached the hotel in Gulmarg, which looked like a wooden cottage with white mountains at the background beckoning you. Later that evening, me and mom stepped out to explore the nearby locality and walked on the tiny lanes around our hotel. Then after a light dinner, we went to sleep so that we are up early for the most awaited part of Gulmarg’s attraction “The Gulmarg Gondola” 🙂 . 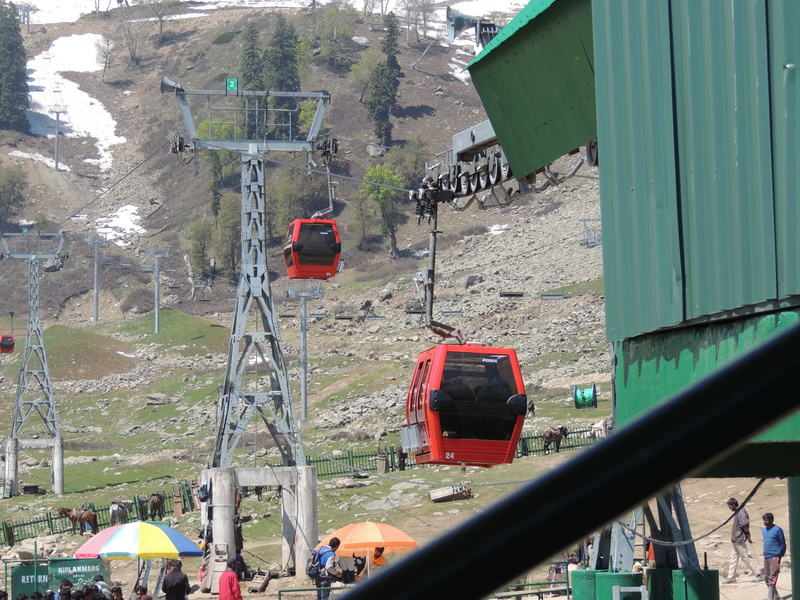 There are two stages of the Gondola-first is the Gulmarg to Kungdoor (Rs.700) and second is the Kungdoor to Aparwath (Rs.900). Tickets for the gondola ride and all other details are available online at this link. It seems they have added a 3rd phase to the ride- the chair lift from Aparwath to Marry Shoulder (Rs.250). Our travel agent arranged the tickets for us, so there was not much of hassle at the ticket counter. It is advisable to book the tickets online as I witnessed too much rush at Gondola counters. The next morning after breakfast we decided to walk to the base of the Gondola ride, as it was not very far from the hotel, around 1-1.5km. And when the weather is cool and there are so many beautiful sights and scenes to witness it is always a pleasure 🙂 . At around 9am we reached the base, where our agent was waiting with ticket for phase1 and phase2. Remember to rent rubber boots if you want to walk on snow. They will charge you INR 100-150 per pair, but this will protect your own shoes. At every phase you need to get down and board a different cable car, so that part I found really tiresome as there were long queues and much commotion. At each phase you can get down and enjoy the area, but we decided to directly go to the phase2 as snow was available only up there at 14000 feet above sea level. Still, we needed to get down from 1st level gondola(8minutes ride) and board the next one(12 minutes ride). After reaching the top, I felt all the waiting was worth the view. It was breathtaking up there, very windy and snow all around. You can opt for the sledge ride or skiing with the help of instructors. They will charge you extra for this. Out of excitement, I even removed my jacket and enjoyed the wind in my hairs and face 🙂 . It was quite sunny that day, so we were quite lucky. I even fell down a couple of times and I must admit it is really difficult to walk in the snow. As only 1 hour is alloted at each phase, so we boarded our cable car back to the base. I wanted to spend some more time up there, admiring the beauty of the surrounding Pirpinjal range and the white snow covering the entire area, but alas all good things come to an end. 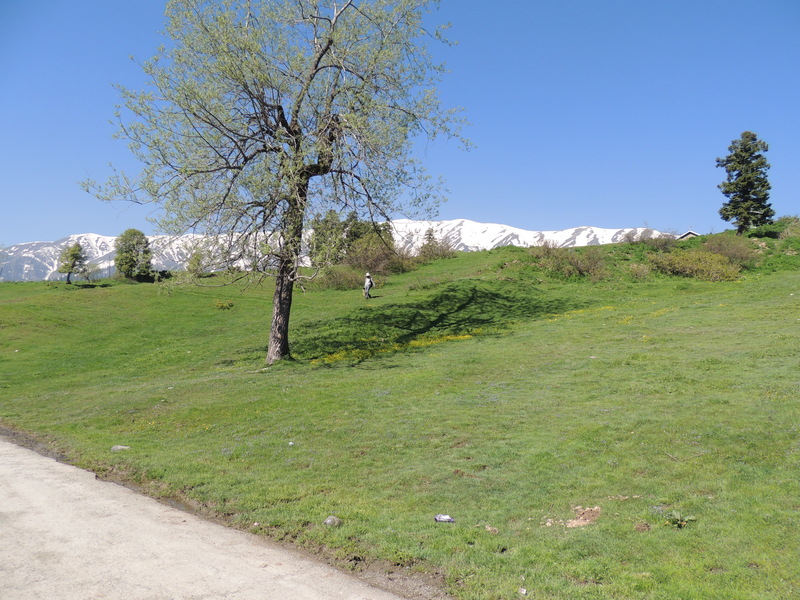 We walked back to the parking lot to start our journey back to Srinagar and bid good bye to the magical Gulmarg. Hoping to come back again. Note: No need to rent jackets from shops if you have packed enough warm clothes. Amazing write-up. It would definitely help travelers to plan there trip accordingly. Keep travelling and keep writing!